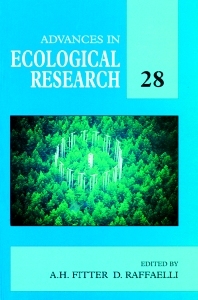 A. R. McLeod and S. P. Long, Free-air Carbon Dioxide Enrichment (FACE) in Global Change Research: A Review. Scott J. Goetz and S. D. Prince, Modeling Terrestrial Carbon Exchange and Storage: Evidence and Implications of Functional Convergence in Light Use Efficiency. Gerard P. Closs, Stephen R. Balcombe, and Michael J. Shirley, Generalist Predators, Interaction Strength, and Food Web Stability. W. S. C. Gurney, S. P. Blythe, and T. K. Stokes, Delays, Demography and Cycles: A Forensic Study. H. Jochen Schenk, Ragan M. Callaway, and Bruce E. Mahall, Spatial Root Segregation: Are Plants Territorial? Tom M. Blackburn and Kevin J. Gaston, The Relationship Between Animal Abundance and Body Size: A Review of the Mechanisms.